I wanted to enjoy this game but sadly it's a little too random for my groups liking. It has been played 2-3 times. 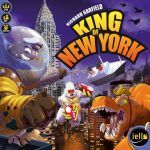 Comes with King of New York: Power Up! expansion (in its own separate box). Perfect, only played a couple of times. Cards have not bent and cardboard pieces are as new.